Just inside the walls of every historic structure in Iran, the unique dazzling tile works sit like a supersize jewel box that you won't forget. Tile works have been one of the most important decorative feature of the Persian architecture since ancient times. Vibrant mosaic tiles lavishly decorate the interior and exterior walls of religious buildings, royal palaces, and residence of dignitaries. 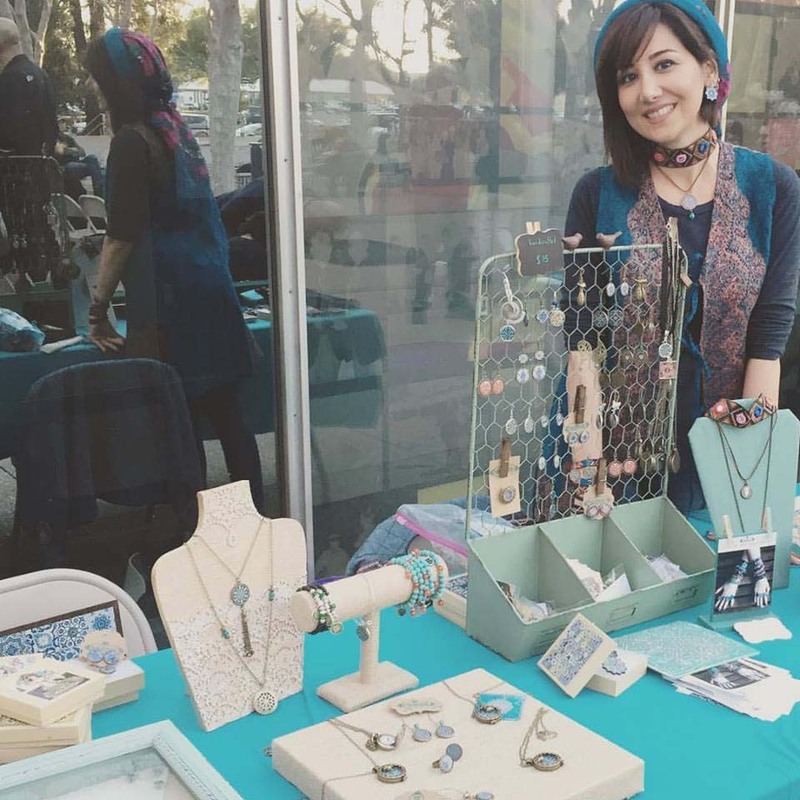 While different aspects of architecture are often related to discussions surrounding buildings, the rich details and patterns of Persian tilework served as the inspiration for the jewelry designer, Neda Khalafi. The beauty of these historic patterns and elements are reflected throughout Neda's work, who believes that the tileworks of a building is actually the jewelry on the building. 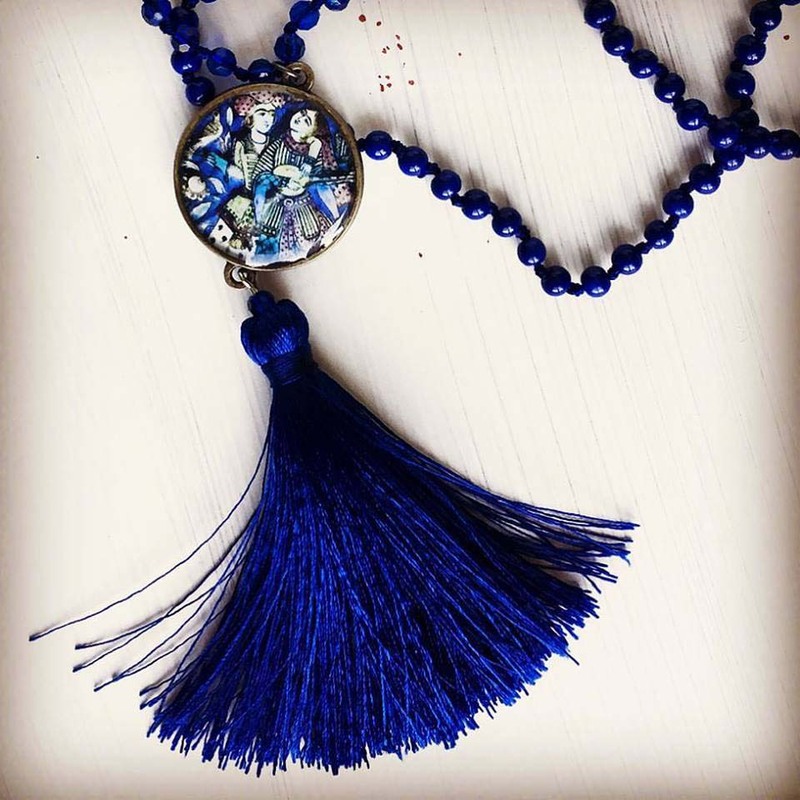 Her thoughts, ideas, and inspirations come together in a line of jewelry called Nedlook. The collection features an interesting mix of modern application of classic tiles and ceramic designs made centuries ago in Persia. 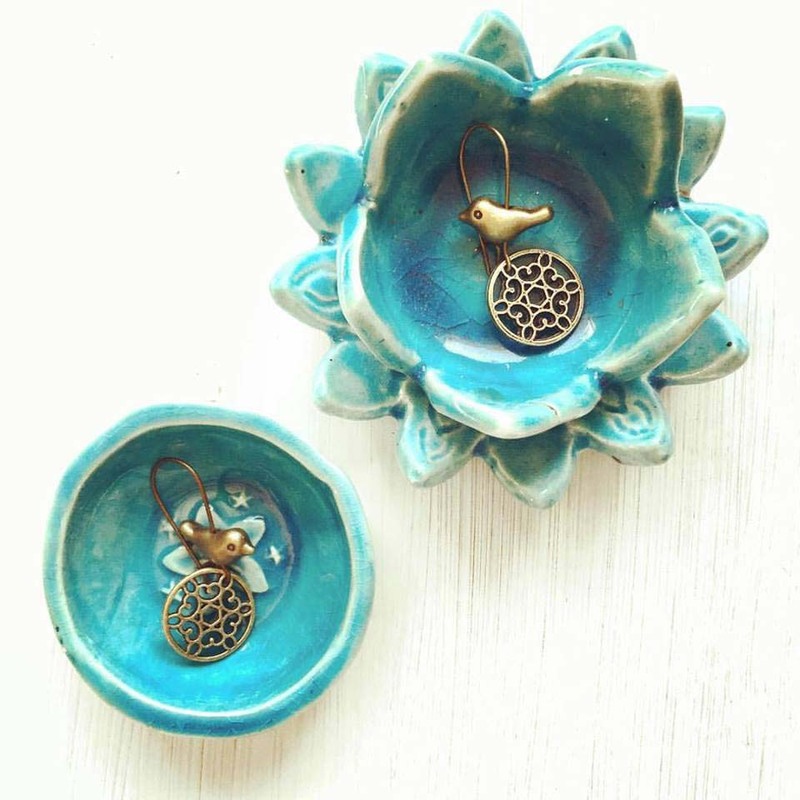 She has incorporated a variety of unique geometric tile patterns into her jewelry designs in addition to many underglaze motifs such as stylized foliage, plants and trees as well as figures of human beings and animals. 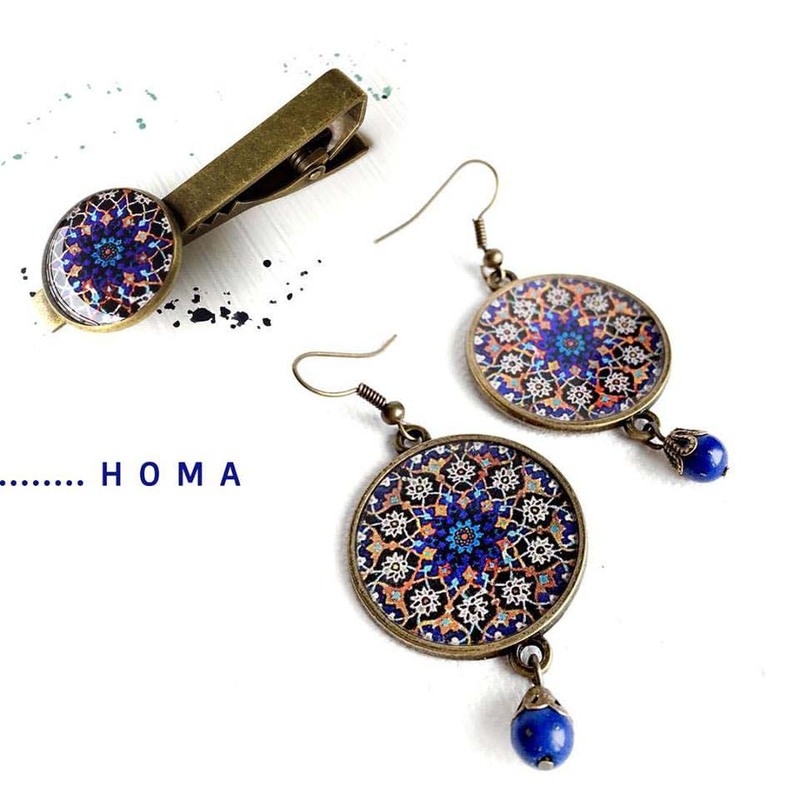 By infusing such detailed patterns into ordinary accessories and blending the old and the new, she gives a modern twist to an everyday jewelry that can brighten up a casual outfit or add a splash of color to ignite a solid black dress. Many designers could have similar inspirations, but different translations. In her opinion every design has a story and the meaning of each piece is as important as the texture, color and form. She is influenced by her earliest roots and mythological symbolism in old patterns and believes the intricate geometric and harmonious repetition of vegetal motifs create a mandala pattern which symbolizes eternity, unity, excellence and completeness. These constant arabesque forms interlaced with geometrical patterns narrate the concept of 'unity in multiplicity and multiplicity in unity' through the language of symbolism. This sense of unity can be interpreted as a reflection of the soul within the universe and every human being. 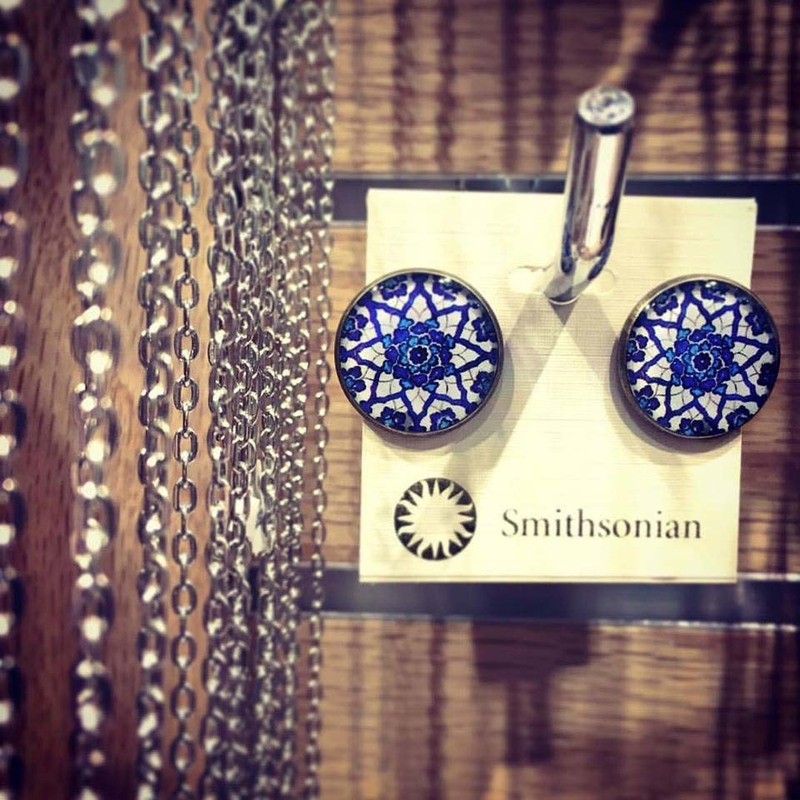 One design that shows up often on her pieces is a star-shaped tile which once adorned the walls of the Madrasah Ghiyathiyya, a school completed in 1444 A.C. in Khurasan, Iran. It shows an interlaced design of vegetal patterns and flowers reserved against a deep cobalt background. Tiles such as this are known to have been placed in combination with both glazed and plain brick sets in geometric patterns. An identical ten-pointed tile with this exact design can be found in the Metropolitan Museum of Art, New York. 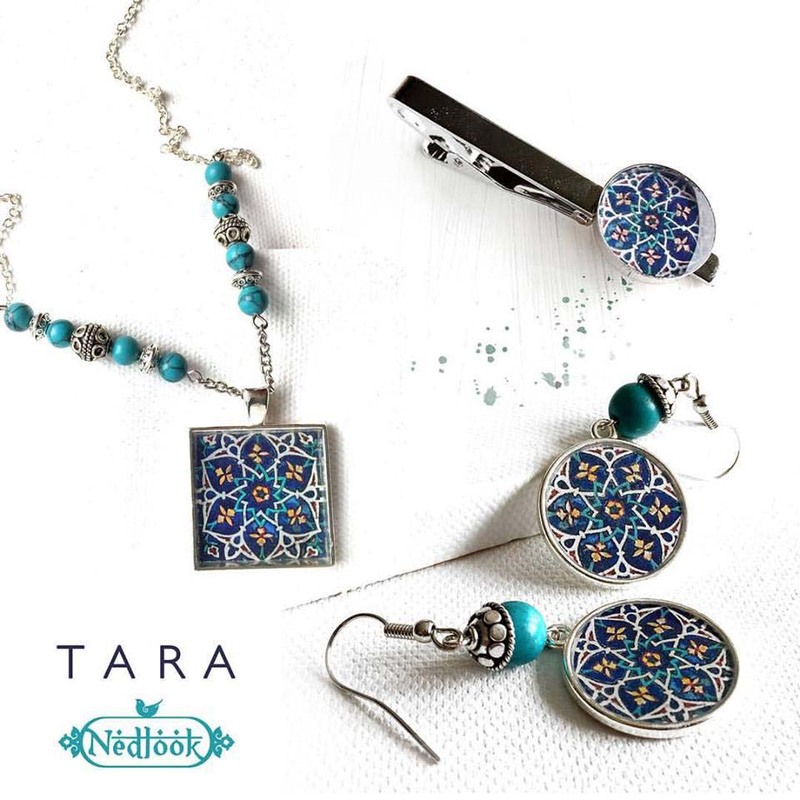 A remarkable decorative details of tiles from Jame Mosque of Yazd is featured on a ring, necklace and earrings. 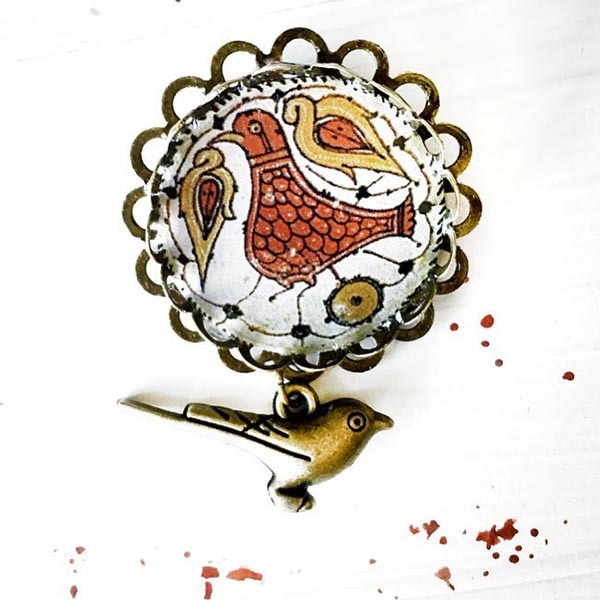 Neda outlines that this pattern is one of her best sellers as it brings a part of history to our everyday lives. The Jame mosque of Yazd is decorated from top to bottom in dazzling various shades of blue mosaic tiles that are well distinguishable yet rich in variety. The elegant patterns of brick work and the priceless inscription of glazed mosaic tiles, all create a variety of decorative techniques and reflect the cumulative history of the mosque's construction and reconstruction during the 12th century to 14th century. Although Neda's work is an expression of her personal belief and admiration for color and intricate geometric patterns, it is also inspired largely by the love of her homeland, Iran. Neda is a Nevada based artist who considers herself as a citizen of the world with a heart without borders. She has studied Industrial Design at university and received her Bachelor's and Master's degree in 2009. Always an artist, Neda continued her studies in Engineering Management and graduated with a MS degree from Missouri University of Science and Technology. She believes art and design education are a lifelong process that develop over time. As a designer, her design experience and artistic background has given her the tools to achieve her passion for creating artistic products that are consumer relevant. Pushing boundaries, seeking out, and accepting new challenges are all part of her experimental process which makes her a motivated designer. Neda's work is best described as a union of simplicity and emotion with a mixture of pattern, color and texture that ignites imagination and sends you to an inspiring wonderland. In 2015, with maturity and a broader view of the world, she focused her talents on jewelry designing. 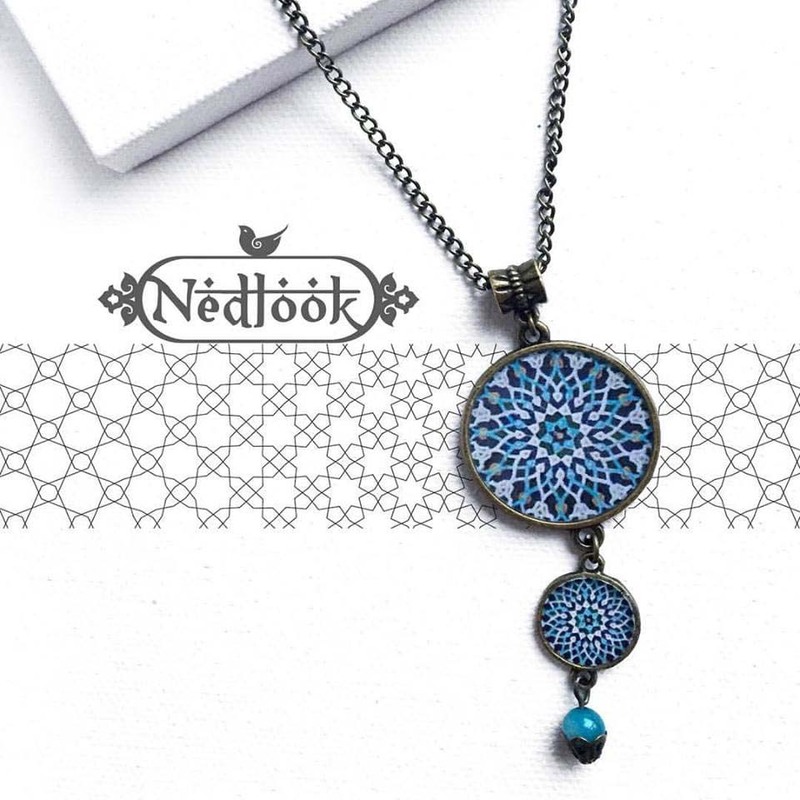 With influences deeply rooted in the historical and spiritual designs of ancient Iran, she started a jewelry line named Nedlook in order to share the beauty and such a rich history of old Persia. She loves tiles, she loves the force and the power of their vivid colors and the ability of these little pieces of art that let her travel from town to town, and from one country to another. She began to show her work in public and at many craft fairs in Washington D.C., North Carolina, Michigan, California and Toronto, Canada. Her decorative tile jewelry is currently available at the Smithsonian museum, Freer and Sacker gallery in Washington DC. What she has tried to maintain is a price point where all women can own a piece of Persia! Neda's art resonates in the hearts of people from Iran and brings a spiritual message to those who have a special place in their hearts for this land.